The Heavy Duty Sled Base Sprinklers provide you with a commercial grade quality product in a residential sized package. In addition to the already durable construction, the sled is available with a brilliant green powder coat baked-on finish or our hot-dip galvanizing process in which the sled has been submerged in molten zinc alloys to form a non-corrosive, scratch and rust resistant barrier between the steel and the wet environment in which it will be operating ensuring years of trouble free use. These sled based sprinklers are designed to work with flow rates and pressures typically found at your homes garden hose spigot and can be connected to a standard 3/4" garden hose. We offer three sprinkler head options to best fit your irrigation needs, the Impulse, Rotor, and Xcel Wobbler sprinkler heads. These are great general use sprinklers. They give excellent coverage in many residential lawn or garden applications. The sled base has integrated metal weights that give it added stability. 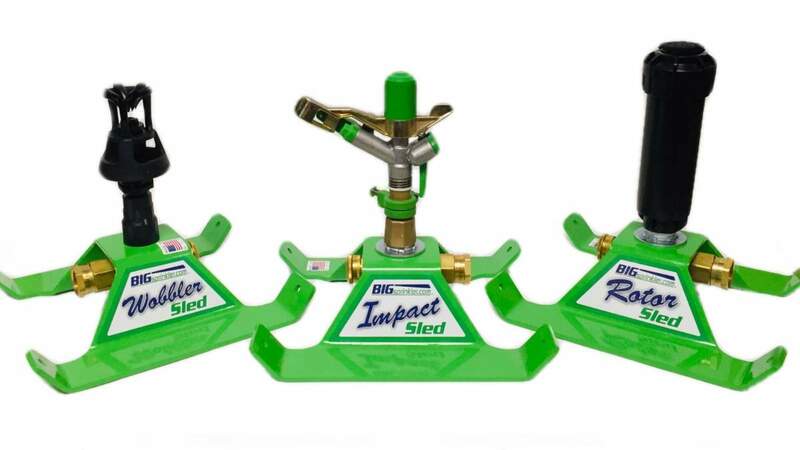 We offer sled base options for impulse, rotator, and Xcel Wobbler sprinkler heads. If you need a sprinkler that can rise over flowerbeds and garden, tripod sprinklers are a great choice. This is a commercial grade sprinkler that can't be found in local stores. It provides continuous circular operation with weighted legs for stability. We carry a variety of heavy-duty spray nozzles that will fit regular and large hoses. Whatever your application or desired spray pattern, you’re sure to find the one you need here. We offer a variety of sprinkler accessories to help with your irrigation needs. These include faucet timers, gooseneck with a shut-off valve, four outlet manifolds, and a hose repair mender.